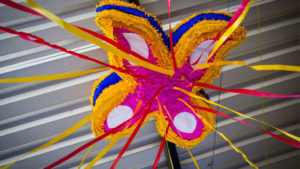 A butterfly pinata from El Salvador. Margaret Hodgson is a CAFOD school visitor and has been inspiring children to Brighten Up for Harvest Fast Day. St Bede’s are brightening up this Harvest Fast Day. 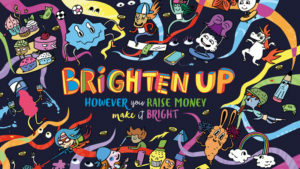 Are you planning to get involved with CAFOD’s Brighten Up event next week? St. Bede’s school in Darlington wanted to learn more about CAFOD’s work in El Salvador and invited me in to help them plan a Brighten Up fundraiser. It was the first time they had invited CAFOD into their school and so I was more than delighted to visit! I was sharing stories from El Salvador in assembly, and found out that the children have already been learning about Blessed Oscar Romero at school, and they had a display taking central place on the prayer table in the hall and on a notice board for everyone to see. I talked about this display during the assembly, and reminded the children about how Romero defended the rights of oppressed people in El Salvador. When I started to talk more about El Salvador, the children were really interested in the lives of Jacqueline and Diego. I shared how CAFOD have been supporting their families for many years, so that they can have the things they need to grow their way out of poverty, for example by helping Jacqueline’s family to grow their own seeds, and by creating safe spaces where children like Diego can learn new skills and help build peace in his community. I explained that it was because of their continued support, and the support of the Catholic community, that more families around the world can build a brighter future for themselves, free from poverty. They were really excited to see the Pinata from El Salvador! Unfortunately, it wasn’t full of sweets, but I did leave behind posters, stickers and collection boxes! 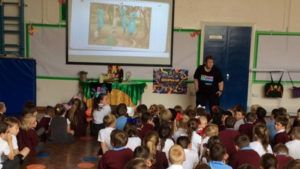 The RE coordinator at St Bede’s, Mrs Katie Salmond, was impressed by how engaged the children were during the assembly and how keen they were to share their fundraising ideas afterwards. She reported that her class are now ‘buzzing with ideas’ for fundraising. The plan is for the children to come into school in brightly coloured clothes and to hold a cake sale and for pupils to prepare a little act or performance so that, as well as fundraising for CAFOD, they will ‘spread a little bright joy’ both in school and in a local retirement home. Go St. Bede’s!